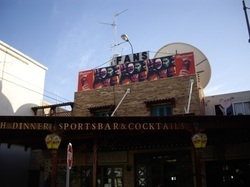 Fans Bar is located just a few minutes walk from the main square in Ayia Napa and serves main dishes and snacks. It is open in the summer months for breakfast, lunch and dinner. 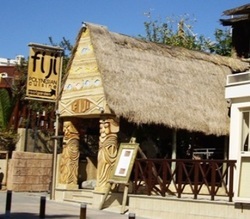 Fiji restaurant serves Polynesian and fusion style cuisine and is open for dinner during the summer months. It is located in the centre of Ayia Napa, just minutes from the monastery and main square. 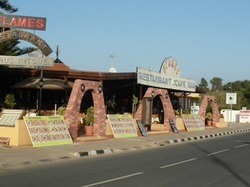 Flames is a large restaurant located just off Nissi Avenue. It has a wide range of Cypriot and international dishes to choose from and is open all year round for lunch and dinner. 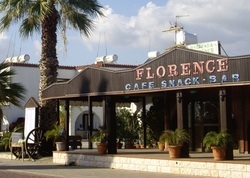 Florence is a cafe bar serving snacks and basic meals throughout the day and evenings. 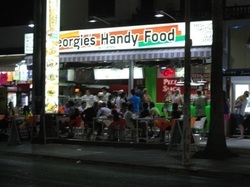 It is located at Sandy Bay, directly on Nissi Avenue. 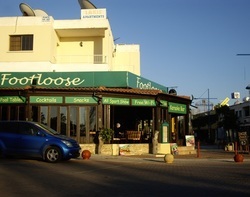 Footloose is a new bar for 2013, located at the start of the main strip in Ayia Napa (Ayias Mavris) Footloose is open for breakfast lunch and dinner right through to the early hours and serves a selection of snacks and main meals. Fourtouna Beach restaurant is located at Sandy Bay, just off Nissi Avenue and is open in the summer months through the day. Frankies bar & grill is brand new for 2013 and is located on Nissi Avenue at the Melpo Antia Apartments, just opposite McDonalds. 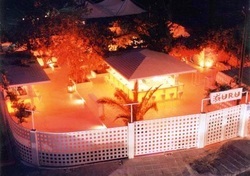 It has modern decor and is very fresh looking in the centre of Ayia Napa. It's extensive menu offers a range of grilled dishes, pasta, burgers, ribs etc. Fresh Cafe is open all year round for lunch, dinner, snacks and drinks through to the early hours. It's menu offers a wide choice of inspired dishes including sharing platters and snacks. It also has an extensive cocktail list and premium brands. 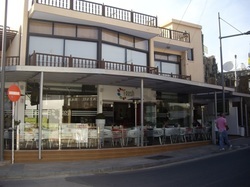 Fresh is located a few minutes walk from the top of the main Ayia Napa square. 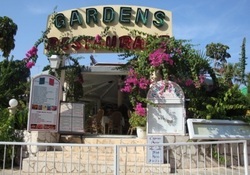 Garden Of Eden restaurant is located on the main road at Macronissos Beach, close to Waterworld Waterpark. Also licensed as a wedding venue, Garden of Eden is very popular for family groups and celebrations. It offers a choice of Cypriot and international dishes and is open in the summer months. Gardens restaurant is open during the summer months for dinner and it's menu comprises Cypriot and international dishes. gardens is located in the Nissi bay area right on Nissi Avenue, just 5 minutes walk from Nissi Beach. 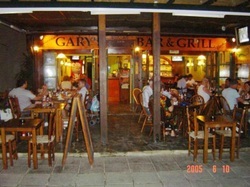 Gary's Bar & Grill is located close to the centre of Ayia Napa, on Nissi Avenue. it is open for breakfast, lunch and dinner during the summer months and has been voted the best breakfast in Napa for many years. It's pub grub style menu is family friendly and popular with tourists and workers alike. 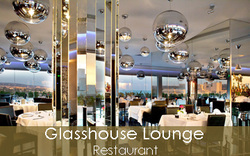 The Glasshouse is located at the Adams beach Hotel at Nissi beach and is open all year round. 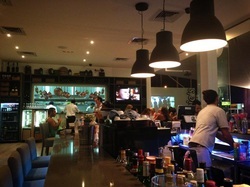 It offers fine dining and an extensive menu of a la carte international dishes. Golden Arrow is very popular with British tourists and offers dinner, drinks and a show all in the one place. Serving a pub grub style menu of main dishes and snacks, golden Arrow is family friendly and is open all day and at night time during the summer months. It is located just across the road from Ayia Napa's monastery. 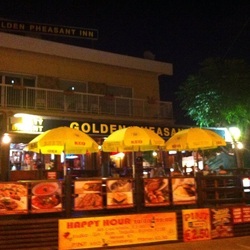 The Golden Pheasant Inn is new for 2013 and is located just a couple of minutes away from the top oft he square. It is open through the day and at night and offers a choice of international and pub grub style dishes and also has karaoke in the evenings. Guru lifestyle bar offers sharing platters and design meals in pretty surroundings and the backdrop of Guru's signature sounds. Located on a side road just a few minutes from the centre of Ayia Napa.